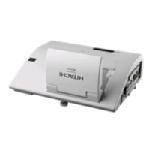 Project a clear image in any classroom or conference room with Hitachi iPJ-AW250N. It features an Ultra Short Throw lens which will project an 80" image at 10" from the edge of the projector. This not only prevents shadows caused by obstructions but also means no shadows and no light shining in the presenter's eyes. For better performance, both an IR sensor and Ultra Sonic technology are used. This increases reliability as well as eliminating lag time from pen to projection for a more natural writing experience. Digital connectivity allows for highest image quality from your HD device. Perfect Fit 2 allows the user to adjust the four corners and four sides of the image one by one. This feature helps correct geometrical and complicated distortions. Some geometric limitations apply. Template function projects lines onto the screen, making it easier to write on a whiteboard or blackboard.